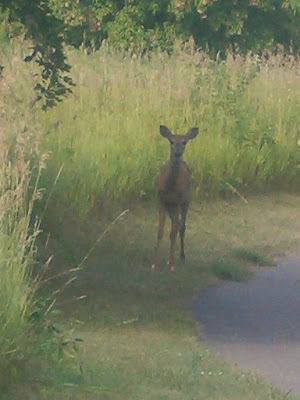 over the little pond across from our apartment earlier last week. More sky views here at Sky Watch Friday. Happy Friday! That crazy ole' sky couldn't make up its mind yesterday. Walking around the lake the wind whipped and the sky would threaten the predicted thunderstorm one minute and just as quickly the sun would produce stunning blue and white. The same wind that gave me an allergy headache later in the day kept those thunderclouds at bay. It never did rain. 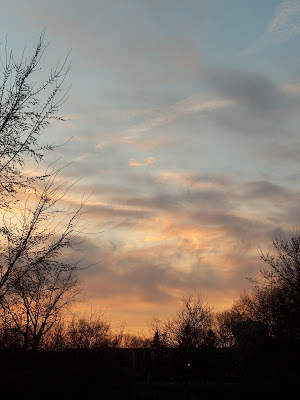 See more skies--never the same--at SkyWatch Friday. Ta-dahhhh! Minnesota is squeaking toward spring and yesterday I captured a photo of the very first daffodil. . .at least, one I've laid eyes on. With giddy pride I post this for Today's Flower's because I finally can show something current, real and lovely. Visit Luiz's virtual flower shop here. Take something home to brighten up your week. Or play along! **The word "Daffodil" didn't come into the English language until the 1500s. 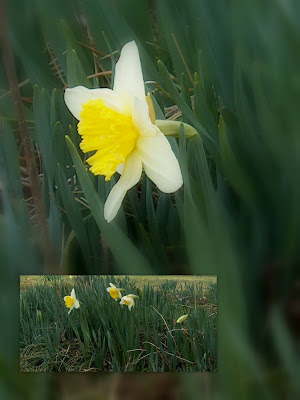 The old name for daffodil was “Affodyle,” believed to originate with the Old English “Affo dyle,” meaning “that which cometh early.” It ultimately derived from Dutch de affodil meaning "the asphodel" (of Greek mythology). and not my ears. Just knowing. Does the whole stand reply in silence ? Her tail flashes and her spotted-one listens. and their own salty runestone. Pain and beauty coexist; without my words. 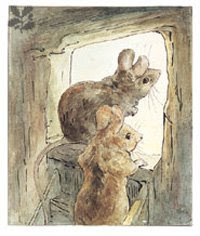 They feast on wild plum trees. free of my desire to give them a name. 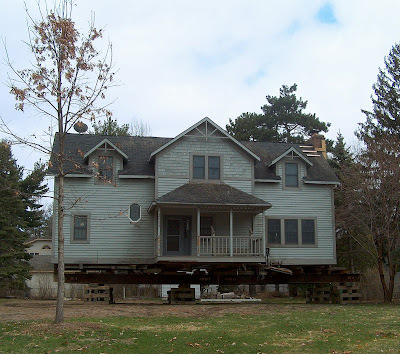 Visit Sunday Scribblings for more answers to the prompt, Language. I rest my case and my cash! So, in spite of this recessionary period we're in, I'm feeling benevolent toward my little cat Bean. 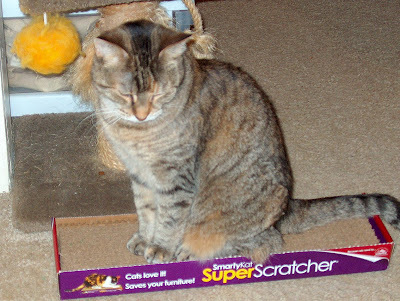 She has only one scratching post made for that purpose to her name. However, that doesn't mean she's above sharpening her claws on other random pieces of furniture. This causes Dave to threaten to have her declawed which in turn drives me crazyer. She is a tall American Tabby and has to stoop to use her assigned post. Long story short, I paid $6 for this little gadget which promised that cats love it and it will save my furniture. Even Erica's cat, who is a bit, shall we say, s.i.m.p.l.e. loves hers and uses it religiously. At the beginning of April for the last 28 years I've been celebrating, baking, frosting, wrapping, blowing up balloons--the whole party routine--because Dave and Erica's birthday are two days apart. Now that our nest is empty with both fledglings living far away it is definitely more low key when April 11th arrives. 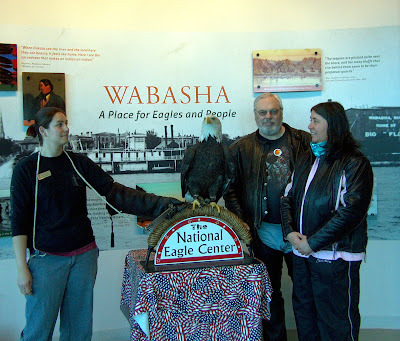 This year to celebrate his birthday, Dave and I rode the bike to Wabasha MN to visit the National Eagle Center. 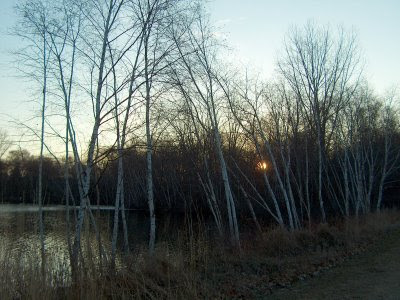 This new facility sits on the Mississippi River along the nesting area of bald eagles. 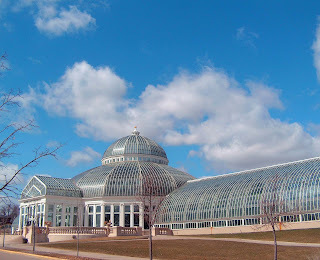 The Center has four live eagles who are unable to live in the wild. Here we are with Angel, the youngest eagle--read about Angel here. Also see a clip of Harriet, another eagle at the Center, who visited Stephen Colbert on the Colbert Report here. See more beautiful, whimsical, precious and lovable animals on Misty Dawn's meme, Camera Critters. . .or join in the fun. On one of the sunny day last week I took my first walk of the season around my beloved Island Lake sanctuary only to round the bend and intrude on this muskrat in his/her morning toilette. 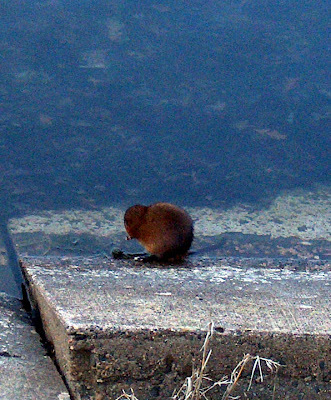 Later I spied this little critter swimming way across the lake, presumably scrounging for breakfast and nest material. 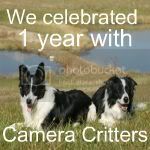 Visit Misty Dawn's meme Camera Critters--now celebrating its 1st Year Anniversary!-- for more stirrings of spring. 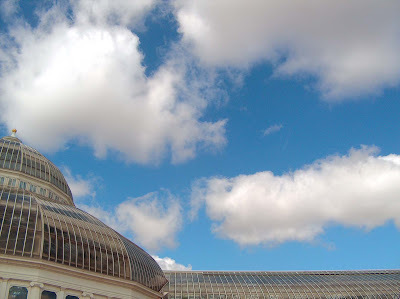 let the record show that on this date the sun came out and the sky was blue for one solid day--an event not witnessed for at least 7 days beforehand. 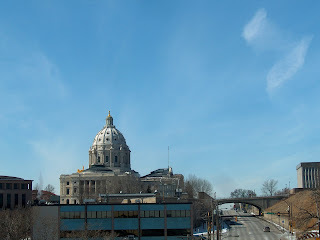 I can prove it by the photo below of the Capitol in St. Paul that I took last week. That was the only day that week the sun was out too. 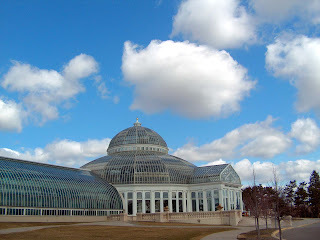 For more beautiful sky views and less whiny commentary from fellow photographers, visit SkyWatch Friday. Happy weekend! hangs over everything is better.